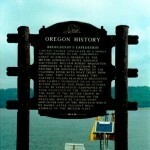 Subject: Furthest point inland reached by British Comander William Broughton sailing up the Columbia River in 1792. Captain George Vancouver in a voyage of exploration to the northwest coast of America ordered by the British Admiralty Office assigned Lieutenant William Robert Broughton, Commander of H.M.S. Chatham, to explore the navigable waters of the Columbia River with boat crews from his ship. This point marks the farthest inland reached by Broughton who camped overnight on an island within sight of this point on October 30, 1792. By appropriate ceremonies he took possession of the observations on the headland which he called Point Vancouver and on the mountain which he named after Viscount Hood Admiral of the British Fleet.